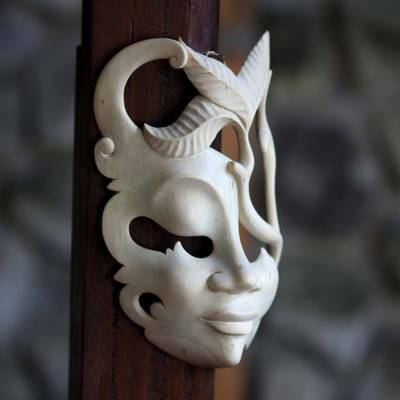 Hibiscus Wood Abstract Mask, "Javanese Girl"
Hibiscus wood reveals the smooth features of a Javanese woman. Caressed by forest leaves, the girl's innocent beauty is manifest. Bali's Eka presents the sweet image. Please note: Hibiscus wood varies widely in its color and grain, thus each mask is an absolutely unique work of art. You can find hibiscus wood mask 'Javanese Girl' by Eka in masks categories such as Leaf and Tree Masks and Wood Masks. Enjoy exploring these sections for other Novica treasures. The gift wrapping was beautiful. I was disappointed when I saw the mask. Due to a bad choice of the original piece of wood, the whole area below the lower lip was dark brown which appear like a beard female. The artist, Eka, should have picked a different piece of wood to engrave the mask from. The mask appeared as if the chin broke off and replaced with a dark brown wood. I understand that a different shade of color in the wood would be okay but not the whole area below the lower lip. Eka should not have sent this piece out and should replace the one she sent me. It was defective considering all the picture of her products , which are beautiful. Other than the aforementioned defect, the mask is okay. Does NOVICA do quality control for items that are sold before shipping?